Second-graders in Ox Ridge Brownie Troop 50629 with Ox Ridge School nurse Barbara Spielman, who recently helped the girls earn their First Aid Badges. 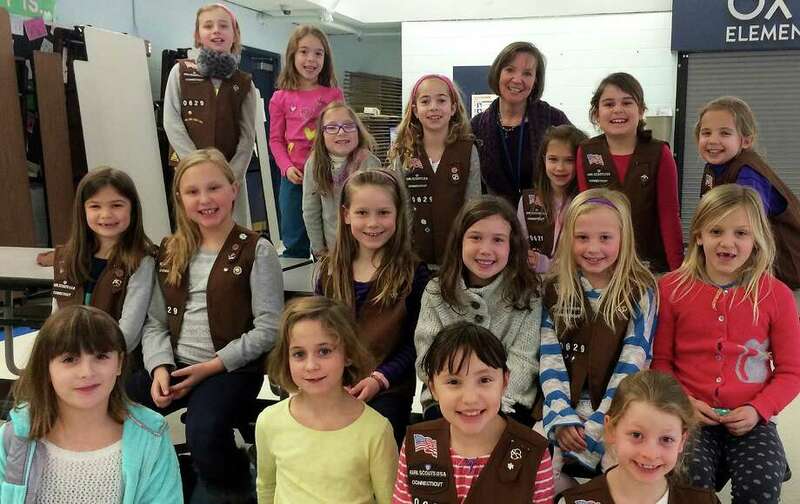 Even though its "cookie season," the second-graders in Ox Ridge School Brownie Troop 50629 recently gave priority to earning their First Aid Badges. Among the things the girls had to do to earn the badge was visit a professional in the medical field. To meet the requirement troop leader Kristine Miller organized for Ox Ridge's school nurse, Barbara Spielman, to visit with the girls and make a presentation on her responsibilities. During the meeting, the girls were informed about the troop's first aid kit and practiced putting on gloves and bandaging each other. They discussed the "9-1-1" emergency number, when to use it and possible questions they may be asked if they call in an emergency. Various medical scenarios, such as bee stings, poison ivy and sunburn, as well as prevention and treatment were also discussed. Each of the girls earned a First Aid Badge and, according to troop officials, are now focused on cookie sales.